My baking journey, my passion. A trip to the States made me fell in love with Apple Cider drink. I discovered that the Americans like to have warm Apple Cider during Autumn season. When I was in Pike Marketplace during one of the Falls, I came upon a stall at the street selling Apple Cider. Since I had it before (in Singapore once), I decided to have a go at it again as I like Apple cinnamon combination. That one sip of th warm Apple Cider in the cold Autumn made me so happy! It was the nicest hot drink I ever had! It was so unforgettable! Since then, whenever I am in US, I will look for homemade Apple Cider drink. And I usually like it hot. However, when I'm back home, Apple Cider is nowhere to be found. It is not readily available. And so, I decided to make it myself. The first attempt was made with ground cinnamon, and lemon slices. The oomph impact was not there. My second attempt was with much success with cinnamon stick and oranges. The richness and thickness of the apples was really nice. 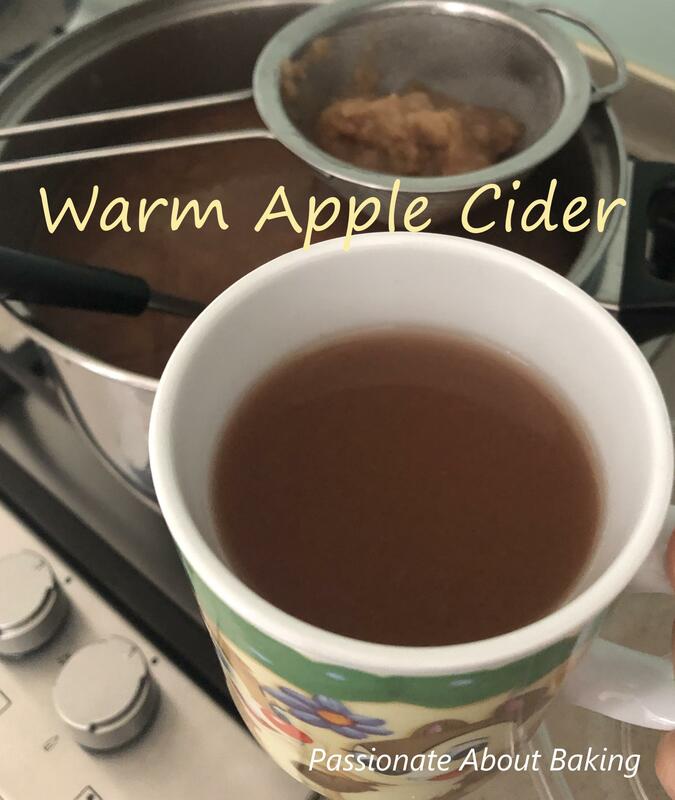 Nothing beats a homemade apple cider! Recipe for Apple Cider, adapted from Sally Baking Addiction. 1. Wash the apples, cut into quarters, and place in the pot. Zest the orange, and add the zest to the pot. Slice the orange and add in. Add the cinnamon stick and cloves. 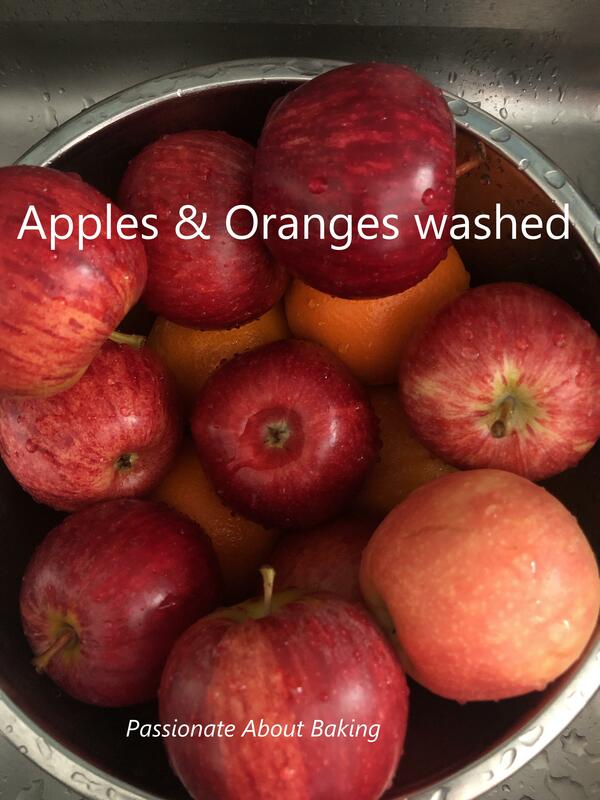 Add enough water to cover the fruit. 2. Turn on high heat and let it boil. Once boiled, turn to low heat and simmer for 30mins. 3. The fruit will be very soft. 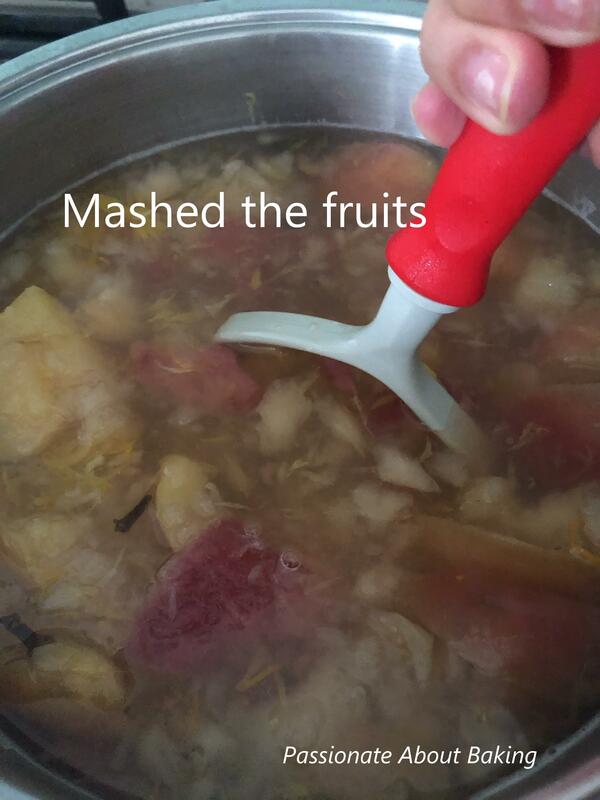 Use a potato masher to mash the fruit and release its liquids. 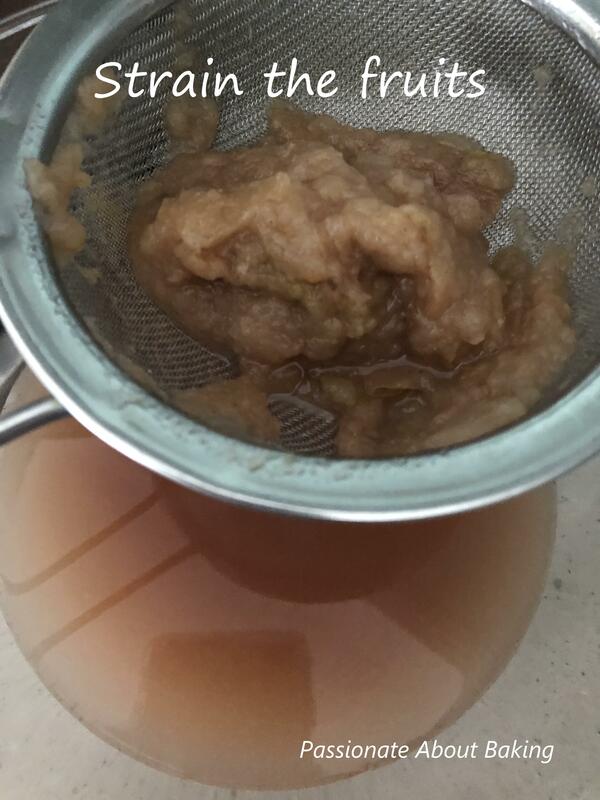 Allow the cider to cook on low for 15 mins more. 4. Let it cool down till desire temp. Very slowly strain the chunky liquid though a fine mesh sieve into a pitcher/bowl. You can discard the solids. Serve the cider warm. 5. Leftover cider keeps well in the refrigerator for up to 5-7 days. Warm up before serving-- or drink it cold. 6. Make ahead tip: Cider can be frozen up to 3 months. Thaw in the refrigerator. 1. As I like natural sweetness, I did not add any more sugar. You may add sugar to your likeness. 2. 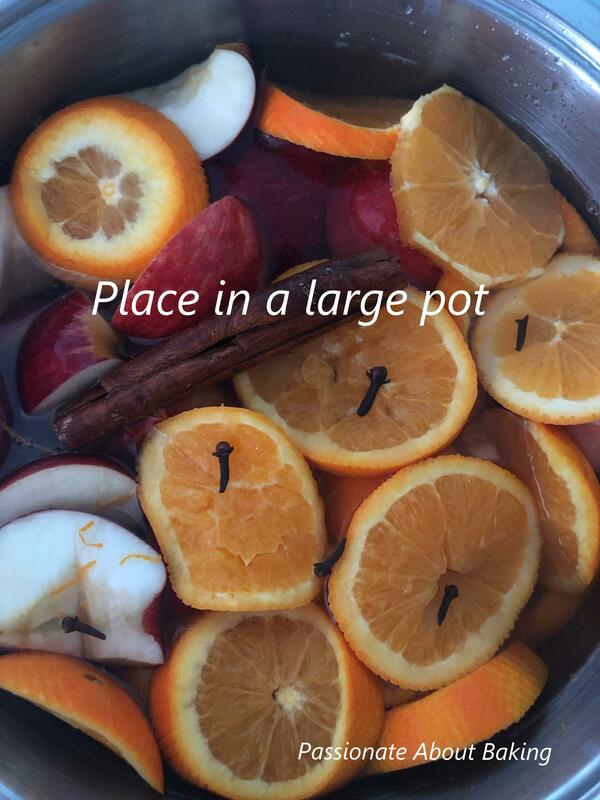 If you want to simmer longer or keep the fruits in, remove the orange pith to avoid getting the cider to become bitter. Since my quest for no carbo breakfast, I have been planning and preparing my breakfast myself. Many times, I baked my food the day before, kept some in the freezer and request my helper to heat it up for my breakfast for the next few days. One of the reason I have decided to go carbo free breakfast (on weekdays usually) was due to a talk I attended when I was at Amity Wellness. Since that time, I have try to prepare carbo-less breakfast when I go to work. There are of course cheat days and exception days. But it will revert back to carb-less days once I go back to my routine. Not having carbos in my breakfast means I have to be creative in what I eat. I'm always on the quest to search for recipes which are easy and can be frozen. 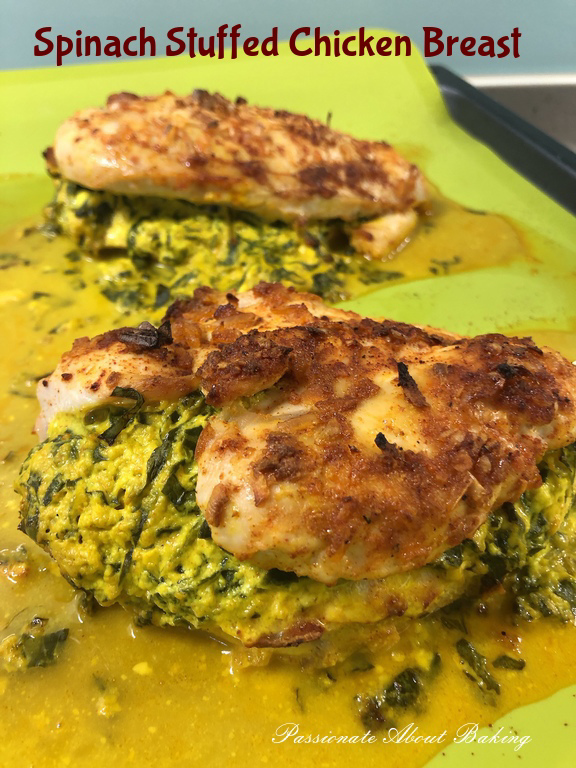 This recipe - Spinach Stuffed Chicken Breast is healthy and easy to prepare. I took this with kale in the morning. 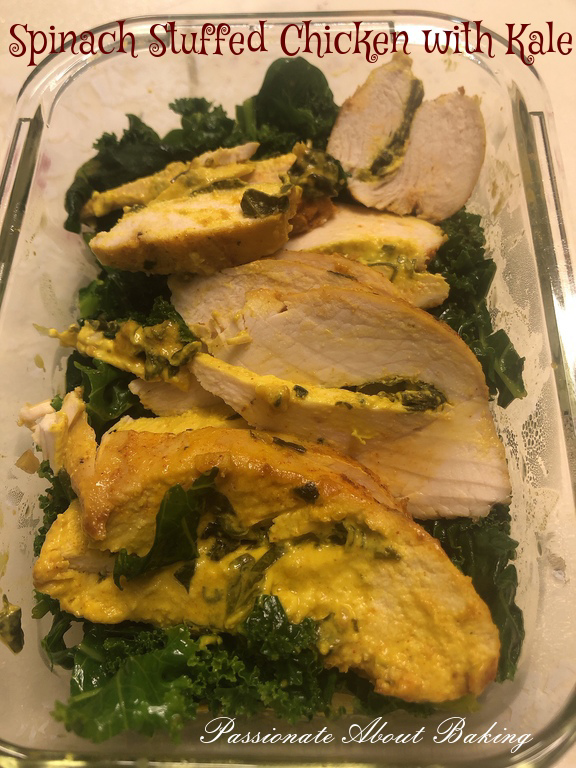 Recipe for Spinach Stuffed Chicken Breast, adapted from That Low Carb Life. 1. Preheat oven to 170C. 2. Place the chicken breasts on a cutting board and drizzle with olive. 3. Add the paprika, salt, garlic powder, and onion flakes to a small bowl and stir to combine. Sprinkle evenly over both sides of the chicken. 4. Use a sharp knife to cut a pocket into the side of each chicken breast. Set chicken aside. 5. Add cream cheese, mustard, spinach, garlic, chilli powder, salt and pepper to a small mixing bowl and stir well to combine. 6. 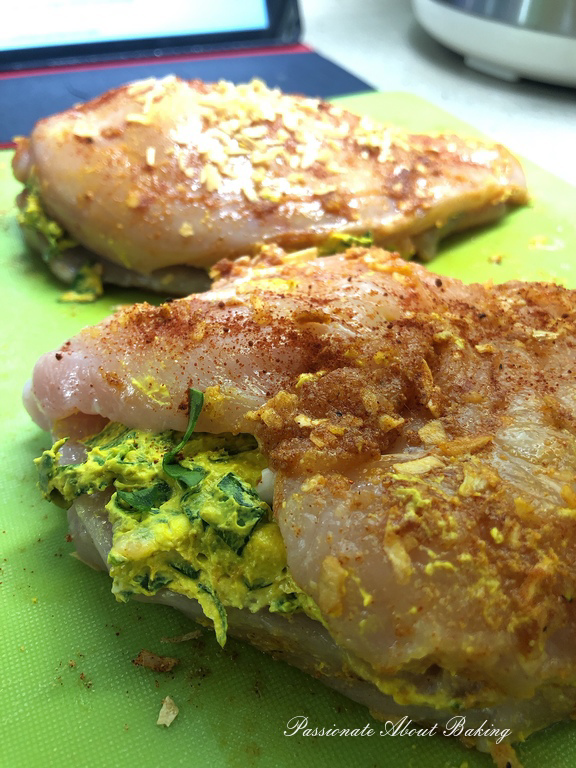 Spoon the spinach mixture into each chicken breast evenly. 7. Place the chicken breasts in a baking tray. 8. Bake, uncovered, for 22-25 mins or until chicken is cooked through. My recent trip to the new Library@Vivo City brought me back a baking book - The French Baker. The book has many good pastry recipes, which was difficult to resist. 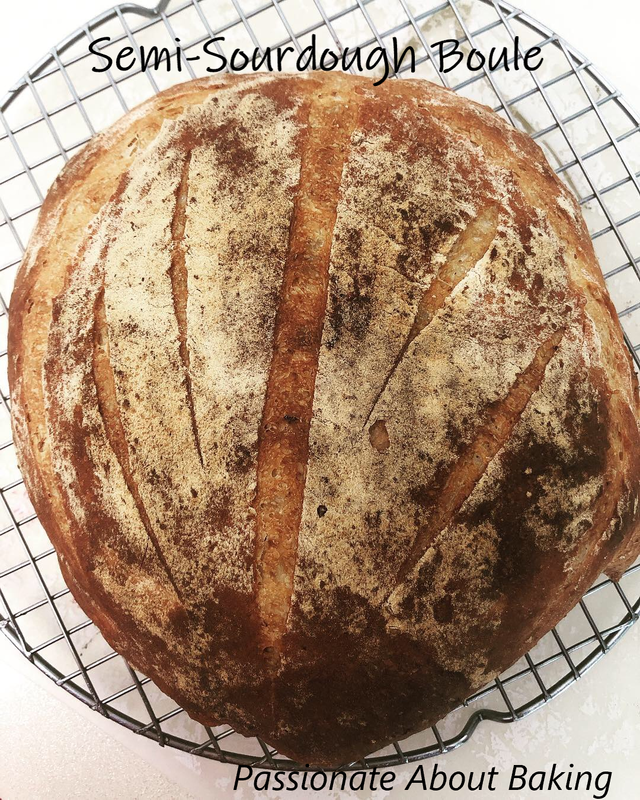 For a bread lover like me, the first attempt was to try his Semi-sourdough bread. 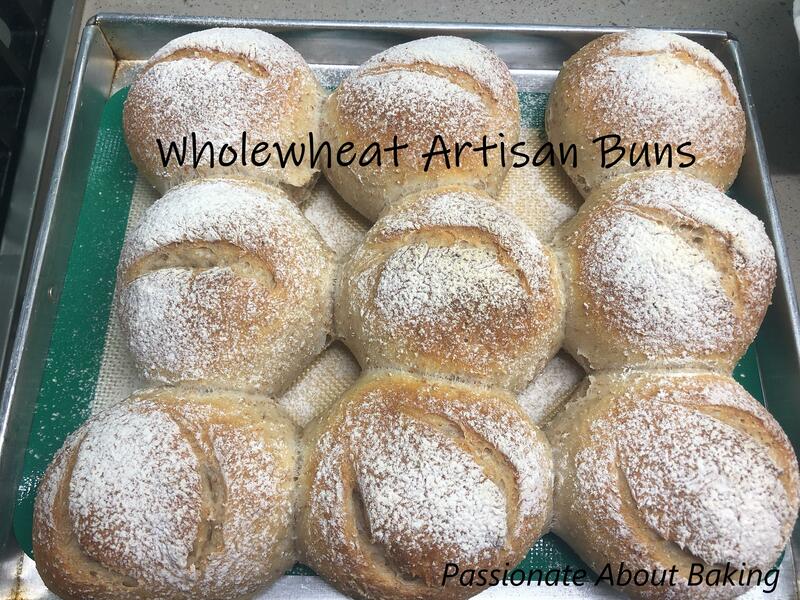 The second attempt, I baked into smaller buns and added wholemeal flours. 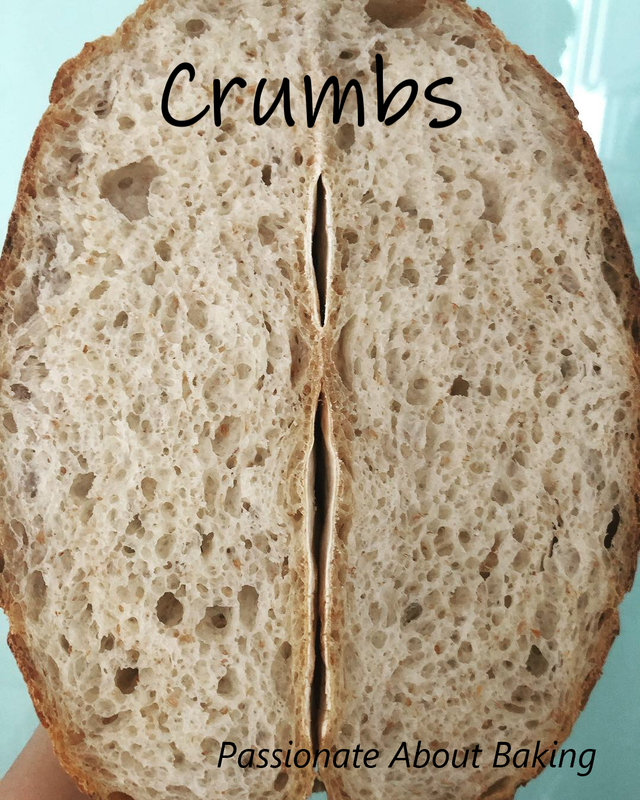 The crumbs were soft and light. I really like the flavour. I think I might end up with buying this book to keep! 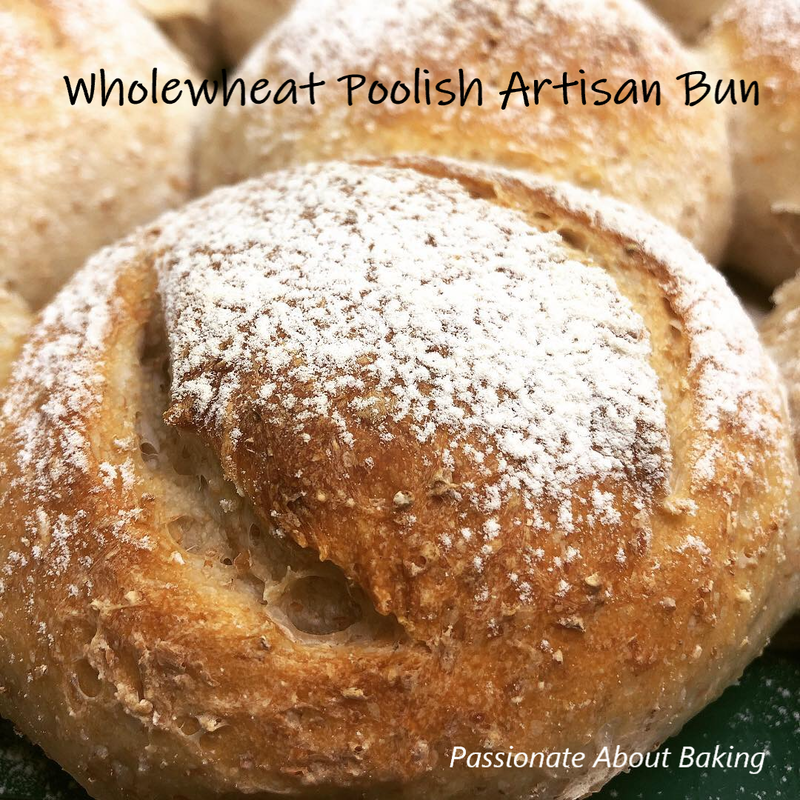 Wholewheat Poolish Buns, adapted from The French Baker. 1. Put yeast and water in a medium bowl and stir till fully dissolved. 2. Add the flour and whisk gently until a soft sticky paste forms. 3. Cover with cloth or plastic wrap and refrigerate overnight. 1. Place flour, water, salt and yeast in the bowl of an electric mixer fitted with a dough hook and mix on low speed for 10mins. 2. Add the poolish, increase speed to medium and knead for another 10mins or until the dough comes away from the side of the bowl. 3. Do the windowpane test. 4. Then cover the dough with a cloth in a bowl and set aside in a warm place to prove for 45mins. 5. When the dough has risen, knock it down, then fold the sides towards the centre to remove as much gas as possible. 6. Cover and set aside for another 45mins, or until double in size. Then knock the dough down again. 7. The dough is now ready to be divided and balled. 8. Place the dough on a lightly floured work surface. Divide the dough equally into 9. Approximately 132g for each dough. 9. Take a portion of the dough in the cupped palm of your hand and flatten slightly. Then bring the outside edges into the middle and pinch to seal. Turn the ball over and drag the base over the work surface several times. 10. 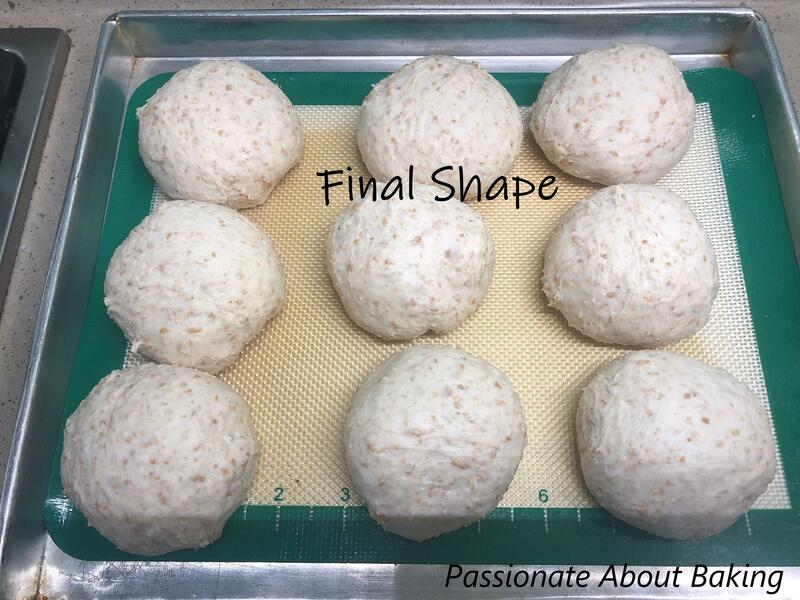 Place the balls, seam side down on a lightly floured tray, cover with a cloth and set aside to prove for 1-1 1/2hrs or double in size. 11. Meanwhile, preheat oven to 240C at least 30mins before baking. 12. To check if the dough is ready, gently push it with the palm of your, it should feel soft but the dough should still spring back to its original shape. 13. Dust a little flour over the top of dough. 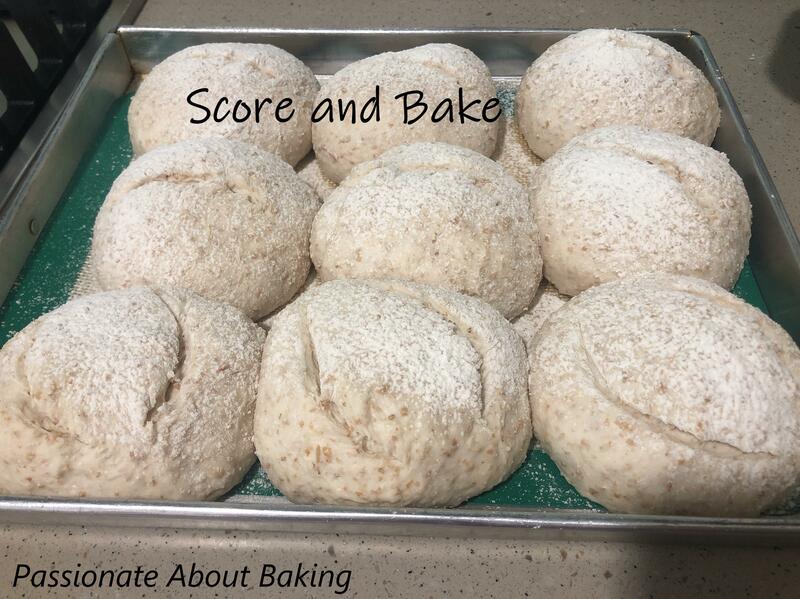 Using a sharp paring knife, score the dough at the sides or the middle. 14. Place on the bottom shelf of the oven and spray water into the oven for 5 secs, then quickly close the oven door. 15. Bake for 20mins. To check if the bread is ready, open the oven door and tap the crust with your index fingers. The bread is ready when the crust feels hard and the bun sounds hollow and dry. 16. Remove from the oven and let it cool completely before consuming. 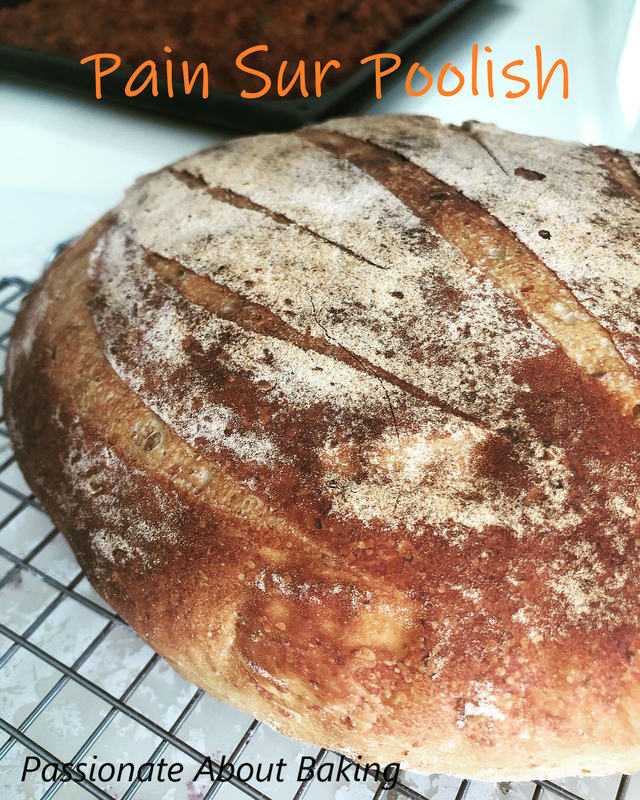 The original attempt of his Pain Sur Poolish. I was satisfied with the crumbs of this recipe, which made me attempt it again...and again. This year's Chinese New Year seems to be my most free period. For usual years, I will be busy baking CNY goodies for my family members. However, this year, I have decided not so, as my sisters didn't want to eat any, and I'm also cutting down on snacks consumption. 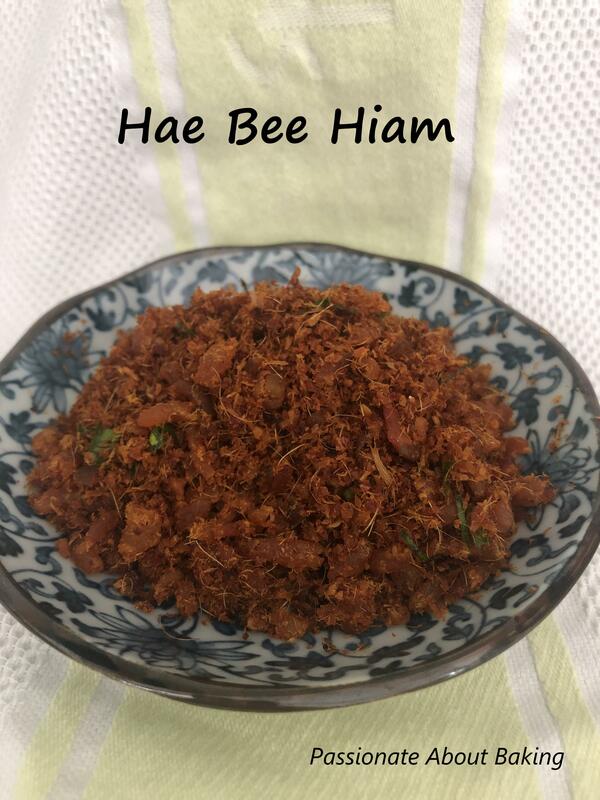 Since I have the luxury of time, I have decided to make Hae Bee Hiam, which can compliment any foods. After making, I realised it was not a difficult process, I should have done this long ago! 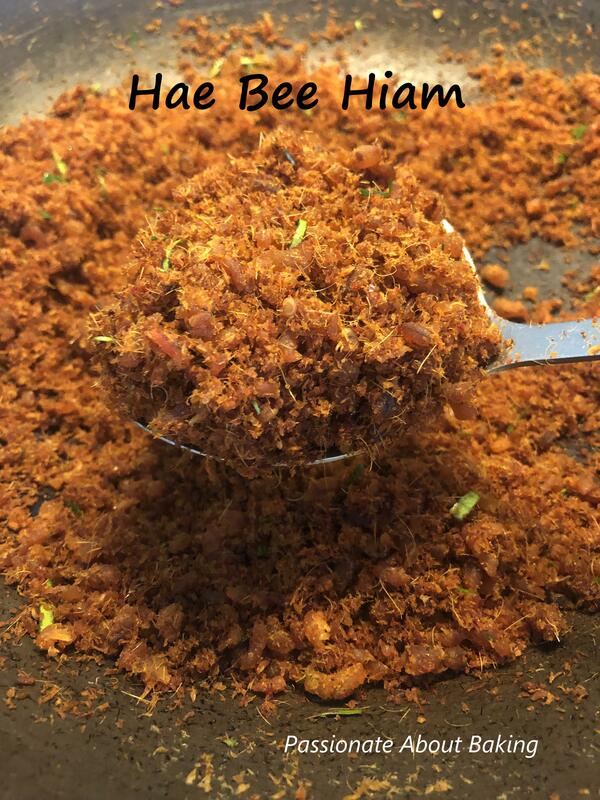 This version of Hae Bee Hiam taste good. With the addition of kaffir leaves, it made the taste very fragrant. It's almost like "tom yam" taste. My learning point is, I had fry the hae bee a bit too long and made it slightly harder, not so chewy. Otherwise, the taste was good. 1. Pulse 300g dried shrimp till coarsely ground, with small bits of dried shrimps. 2. Dry fry the shrimps in a wok till fragrant. Set aside. 3. Blend rempah ingredients in a food processor into fine paste. 4. Heat cooking oil in wok. Approximately 6tbsp. 5. Add in the blended rempah paste. At this point, it will splatter. Stir continuously. 6. 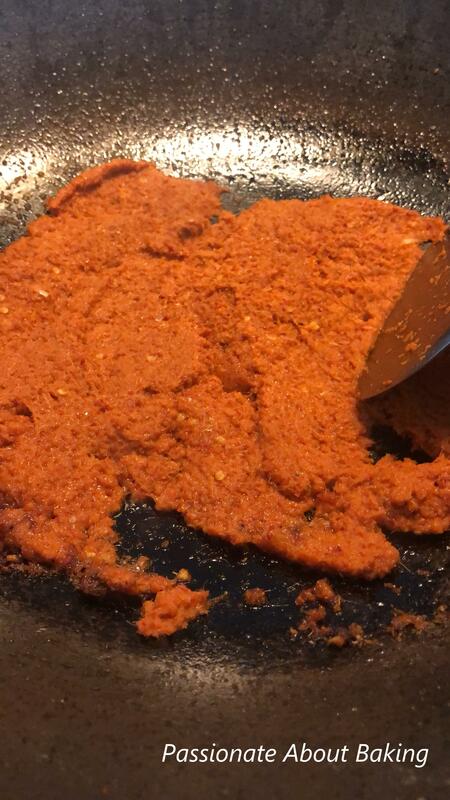 Fry till fragrant and until the oil gets absorbed into the rempah, and until quite dry. 7. Add in the coarsely ground shrimp. 8. Continue to stir fry till well combined. 9. Add in sugar now and stir well. 10. Add in the finely sliced kaffir lime leaves. 11. Fry till the Hae Bee Hiam texture is crumbly. 12. 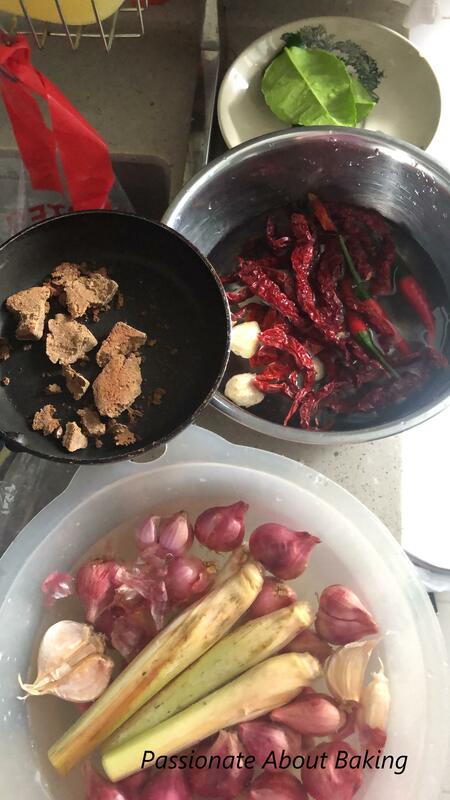 Do not cook too long as Hae Bee Hiam will become dry and hard. 13. Leave to cool before bottling. This post is in collaboration with Floral Garage Singapore. Floral Garage Singapore is an established Singapore florist company comprised of a team of passionate floral hobbyists and professional florists. They offered wide range of flowers from hand bouquets to table centrepiece to standing flowers and even gifts. They also served corporate clients and individuals, and does delivery in Singapore. They are also looking for opportunities to franchise their business. 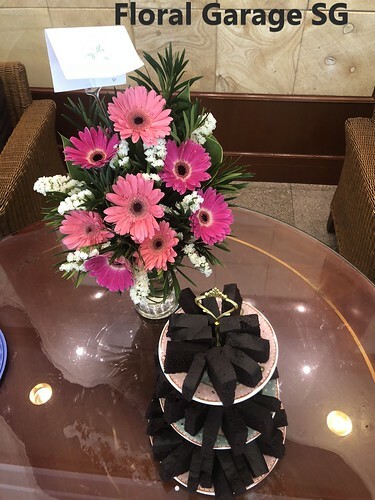 I had the opportunity to collaborate with them recently, using their flower centrepiece to compliment my cake presentation. Their flowers bright and fresh. It made my cake stands out more. The flower display recommended by them is called Martial. Thank you Floral Garage SG for this wonderful opportunity. 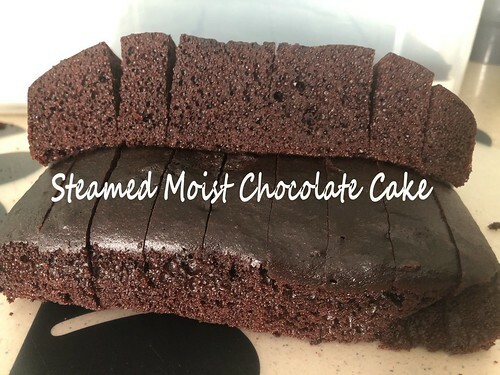 For this function of mine, I made Zoe’s Steamed Chocolate Cake. There were only good reviews on this cake from my guests. 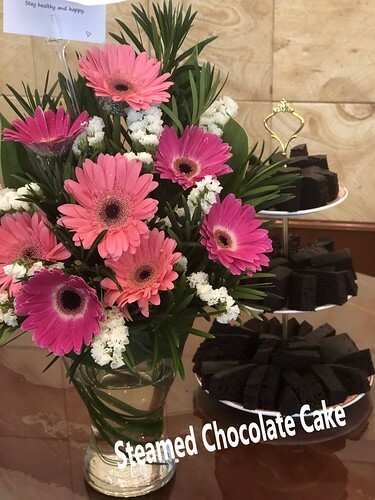 For your next function, why not try this combination - flower centrepiece from Floral Garage SG and Zoe's Steamed Chocolate Cake. It is easy to make and taste delicious without frostings. 1. Line the bottom of the square pans with a piece of baking paper. Preheat steam oven. 2. Add butter, both sugars and evaporated milk in a large saucepan. Place the saucepan over a low heat and use a hand whisk to whisk mixture while cooking until sugar is completely dissolved and mixture is smooth. 3. Remove saucepan from the heat. Allow mixture to cool until it is nearly like room temperature or cool enough to touch. 4. Add eggs and vanilla into the butter mixture and whisk until combined. 5. In another bowl, combine flour, cocoa powder, baking powder, baking soda and salt. 6. Sift flour mixture into the butter mixture and whisk until all are just combined. Do not over mix. Cake batter is runny. 7. Pour batter into the prepared pan and place the pans into the steam oven. Cover pan with a large piece of foil. 8. Set the steam oven for 45mins at 100C. 9. Remove the cake from the oven and allow it to cool completely in the pan before removing it onto a wire rack. 10. Slice the cake into 1cm thick and 3cm long each. 11. 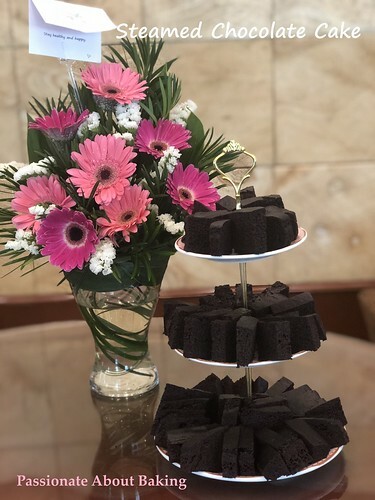 Arrange them into the tier cake display, together with Floral Garage flowers. 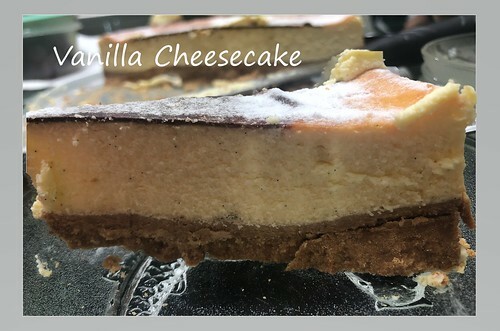 A modified recipe for Vanilla Cheesecake made for my nephew's birthday. It had been a long time since I baked a birthday cake. I requested to make a cheesecake since fanciful decoration is not required. 1. Mix crushed biscuit crumbs with the soften butter until it resembles the texture of wet sand. 2. Using the back of your fingers, press the mixture into the base of a springform pan until the base is firm and compact. 3. Baked in a pre-heated oven of 160C for 10mins. 4. Remove from oven and let it cool. 1. Beat cream cheese and sugar in a mixer until it is smooth without lumps. 2. Add eggs in one at a time, beating until well combined. Remember to scrape down the sides of the bowl regularly to ensure an even mixture. 3. 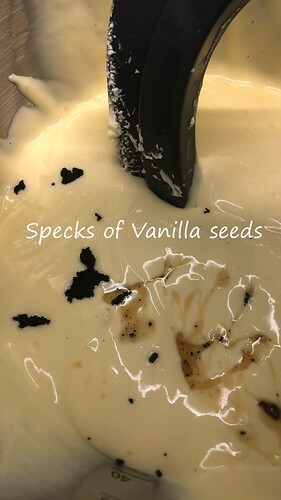 Add in yogurt, followed by vanilla seeds. Mix well. 4. Pour the batter into the pan. 5. Bake in the preheated oven of 160C for 60mins on the 2nd rack (lowest 2nd). 7. Remove the cheesecake from its pan and chill for at least 4 hours. 8. 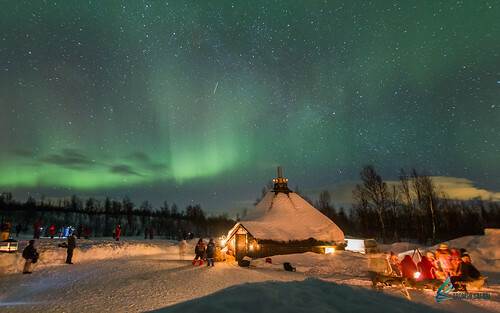 To decorate, sprinkle snow powder. Refrigerate well. 9. Before serving, remove from the fridge and left it outside for at least half hour. Slice, serve and enjoy! My passion is in baking. My dream is to have my own bakery. I've attended numerous workshops and courses. I've attained a Certificate in Professional Baking, Certificate in Cake Decoration and Certificate in Wedding Cake Decoration. I love to learn more about baking, and experience different recipes. 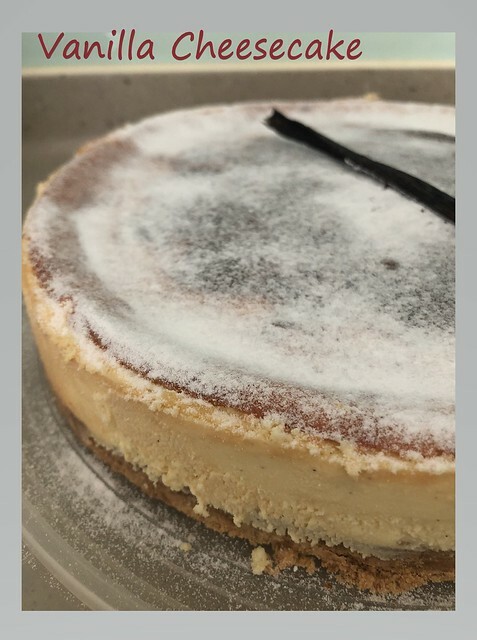 I've also started embarking in teaching in baking, and I hope to share my experiences with people who has the same passion as me. Check out PALATABLE, the blog I set up for my workshops and sales of cakes. Introducing new concept workshop from PALATABLE by Jane. Check out other workshops available. April 2013 - It's Tea Time! March 2012 - March Macaron Madness! November 2011 - Enjoy Cupcakes! Life is too short, eat desserts!